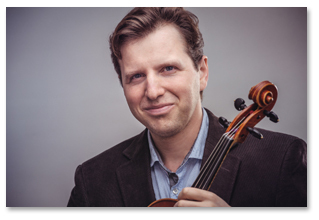 Violist Viacheslav Dinerchtein has appeared as soloist with orchestra, in recitals and chamber music concerts throughout North and South America, Europe and Asia, including venues such as Carnegie Hall (New York), Kennedy Center (Washington), Chicago Cultural Center, Spoleto Music Festival (Italy), the Niagara Music Festival (Canada), Palacio de Bellas Artes (Mexico City), Sociedad Filarmónica de Lima (Peru), among numerous others. He has been a frequent guest artist of the International Viola Congresses (USA, South Africa, Germany, Portugal), and a protagonist of diverse TV and radio broadcasts. Dedicatee of several compositions for viola, among them winners of competitions for composers, he is also recognized for his efforts to popularize the set of solo viola sonatas by Mieczyslaw Weinberg. With Roland Vamos he gave the first performance of William Primrose's viola transcription of Bartok's 44 Duets for Two Violins. Dinerchtein is a member of the Lipkind String Quartet and President of the Swiss Viola Society. Studied with his father Boris Dinerchtein, with Joseph de Pasquale (Master of Music, Peabody Conservatory, Johns Hopkins University), and with Roland Vamos (Doctor of Musical Arts, Northwestern University; diss. "Shostakovich Viola Sonata"). In his free time enjoys reading, chess, photography, cooking and card magic. Born in Minsk (Belarus), Dinerchtein grew up in Mexico, and now resides with his wife and two children in Switzerland. Below you will find the complete list of scores edited by Viacheslav Dinerchtein.